After qualifying as a physician, Robert Richardson (1779?1847) joined the household of the earl of Belmore, and accompanied him and his family on a tour of the eastern Mediterranean in his yacht the Osprey, converted from a captured American schooner. Richardson dedicated this two-volume work to his patron in 1822. Having spent several months in Naples, the party travelled through the Greek islands to Constantinople, arriving in Alexandria in September 1817. Volume 1 recounts their journey up the Nile, exploring both the antiquities of Egypt and the modern cities, especially Cairo, where Richardson made the acquaintance of Burckhardt (whose death he witnessed), Belzoni, Henry Salt and other early explorers of Egypt's past. Having reached the Nile's second cataract, they returned to Thebes, where they were greeted with news of Princess Charlotte's death. 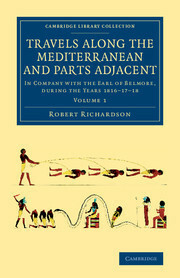 Richardson's account is full of detail, both of the archaeological remains and of everyday life in modern Egypt. Dedication; Preface; 1. Departure from Southampton; 2. Alexandria; 3. Bay of Aboukir; 4. Cairo; 5. Pyramids of Gheeza; 6. Voyage up the Nile; 7. Egyptian deities; 8. Gheneh; 9. The valley of Biban el Melook; 10. Voyage up the Nile; 11. Assouan; 12. Nubia; 13. Assouan tropical well; 14. Koom Ombos.